We set up ou EC training camp at our Gestüt Vorwerk in Cappeln, located in Lower Saxony, Germany. From here it's only about 500 kilometers to the EC venue in Herning, Denmark. Herning, by the way, is not too far from Aarhus/DEN, where my mother took the European Champion title in 1979 with her unforgotten grey gelding Mon Cherie, ahead of Christine Stückelberger/SUI on Granat. 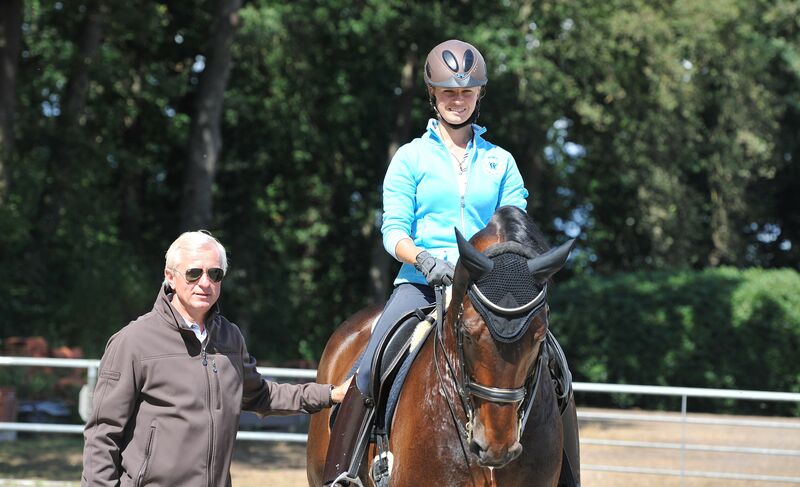 Augustin OLD is in excellent shape and, with the help of my trainer Wolfram Wittig, I am concentrating on the details which also include the transitions. And, of course, the flying changes and pirouettes. Augustin is wonderful to ride at the moment, even though he's always good for little surprises ... stallions love to do that. I also brought Blind Date with me to Cappeln. She and I have grown much closer and the tips I get from Wolfram Wittig, who trained the Breitling W daughter together with his wife Brigitte all the way to Grand Prix, have been very helpful. And I also brought our talented young Chocolat who I also took with me to Perl-Borg. This five-year old mare by our Rosandro, who competed in the final ring of the German Elite Brodmare Show and won the qualifier in Munich, Germany for the Bundeschampionat, has three outstanding gaits and is a very fast learner. She's one of those horses you just need to get on and then go - very easy going character that is very endearing.